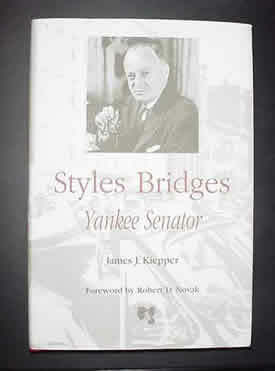 James J. Kiepper, author of the book Styles Bridges: Yankee Senator, will present the Monday evening, November 7th program of Thompson-Ames Historical Society. The public is invited to attend the 7:00 p.m.
T-AHS business meeting as well as the 7:30 p.m. presentation which will take place in Gilford Village’s Union Meetinghous e at 24 Belknap Mountain Road. Professor Kiepper, who grew up on his family’s Hopkinton (NH) farm, has a “country boy” background similar to that of Styles Bridges, who grew up in West Pembroke, Maine, where his widowed mother turned to teaching to support herself and her three young children. The author attributes this similarity of backgrounds as contributing to his insight as he wrote the book Styles Bridges: Yankee Senator. -- Kieppers’ swiftly moving narrative was first published in January of 2001, with a second printing of a limited edition in October, 2002. Styles Bridges’ career began in practical farm management in Hancock County, Maine, where he became county agricultural agent in 1920. The next year he and his wife moved to New Hampshire as he became active in the Farm Bureau, where he met Etta Mae Ames Tilton (a Gilford resident and mother of Arthur A. Tilton). Their friendship continued as Styles Bridges pursued his interest in politics. As became his custom, he gave elephant figurines to his supporters -- and, thus, the elephant collection that is now on display at Gilford Village’s historic Rowe House in glass-fronted wall cabinets created by Arthur Tilton for his mother to use in their Old Lakeshore Road homestead. Noted for his charisma, Styles Bridges became a Concord (NH)-based career politician, who in 1935, became our youngest governor, at age 37. Two years later he was elected to the U. S. Senate, where he grew in seniority and power over the years – until his death in office in 1961. Senator Bridges was for a time chairman of the Senate Appropriations Committee, Republican floor leader, president pro tem of the Senate, as well as an alternate delegate for the signing of the Security Treaty between the United States and Japan following World War II. Styles Bridges was one of four senators to be entrusted with the secret of the atomic bomb proceedings. -- “Yankee Ingenuity”, Chapter 7 of the book, contains a subtitled segment ‘The Manhattan Project’, Bridges’ most important role in World War II, a secret one. Kiepper describes Bridges as a New England senator, a moderate, independent and loyal to the best interests of his country first and then to his Republican Party. In 1940, after winning several primaries, including New Hampshire’s, Styles Bridges nearly won the Republican nomination for president. At the convention, the honor went instead to Wendell Willkie. Bridges declined an offer to join the ticket as candidate for vice president. Professor James Kiepper’s presentation on Monday evening, November 7th is certain to be one worth attending. The Rowe House, located at 88 Belknap Mountain Road in Gilford Village, will be open from 6:15 until 6:45 p.m. that evening, to enable those interested in visiting the historic farmhouse and viewing the elephant collection to do so.—After James Kiepper’s presentation, light refreshments will be served while attendees socialize, as is the custom during Thompson-Ames Historical Society Monday meeting nights. Thompson-Ames Historical Society is a sixty-two year old 501(c)3 not-for-profit educational organization whose mission is to preserve and celebrate the cultural history of Gilford, NH. Membership is open to all persons interested in carrying out the mission of this organization which was founded in 1943 at a time when Gilford’s farm-way-of-life was fast disappearing. More information about Thompson-Ames Historical Society and its programs is available by viewing its website: www.gilfordhistoricalsociety.org. Also, Thompson-Ames Historical Society can be contacted at 527-9009; if you leave your name, telephone number and a brief message, you will receive a return call.